For those wanting amazing seaviews that will stay with you forever then Villa Kordere is for you. For those wanting amazing seaviews that will stay with you forever then Villa Kordere is for you. Located in the Kordere area of Kalkan it's an easy five minute drive to all the attractions of Kalkan itself. Villa Kordere is built in a modern, open plan style to take advantage of the incredible views over the bay of Kalkan. It has a large open plan lounge/kitchen/dining room with modern state of the art fully equipped kitchen, including fan oven, fridge freezer, microwave, toaster, kettle and coffee machine. Fully air-conditioned throughout, all four bedrooms have their own en-suites three of them enjoying balconies and terrace to enjoy the spectacular views. Outside there is a lovely terrace with sun loungers, private garden, private infinity swimming pool, BBQ, sunshade, outside shower and a dining table and chairs for seven people. 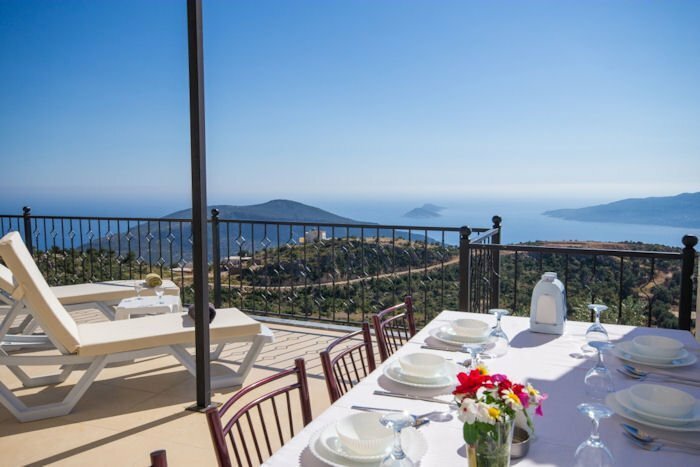 For those not wanting to be in the middle of things but still enjoy enjoy amazing sea views yet still just a few minutes' drive from the resort of Kalkan this makes the perfect choice for you.